PlannerDan: To Connect or Not to Connect? Fear of Traffic. People in single-family neighborhoods, despite often driving a lot, are not big fans of traffic. 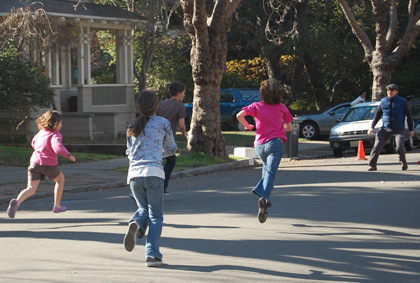 Specifically, they want their residential streets to be free of large volumes of fast moving cars. Some fear the noise that comes with cars, and some fear for the safety of their children. It is very understandable. Fear of On-Street Parking Jams. Some people worry that by providing connections into their streets, people from other areas will park on their streets and take up all of the on-street spaces. This was one of the main fears in my neighborhood, as the proposed connection would have provided a direct link to a new apartment building which is currently under construction. Incidentally, this probably won't be a problem, as the new building will have a large and convenient garage for tenants and guests. Fear of Crime. 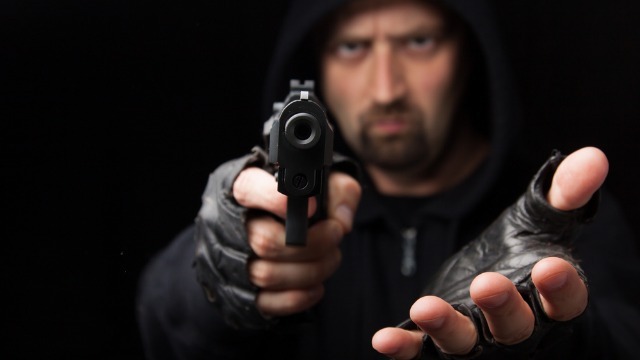 Many people fear that connections will allow unsavory characters to wander into their streets and wreak havoc. Sometimes this is due to simple bigotry, other times it is due legitimate concerns based on recent criminal activity in the area. Dangerous Dead Ends. If you're worried about crime, it's hard to understand how creating dead ends helps anything. 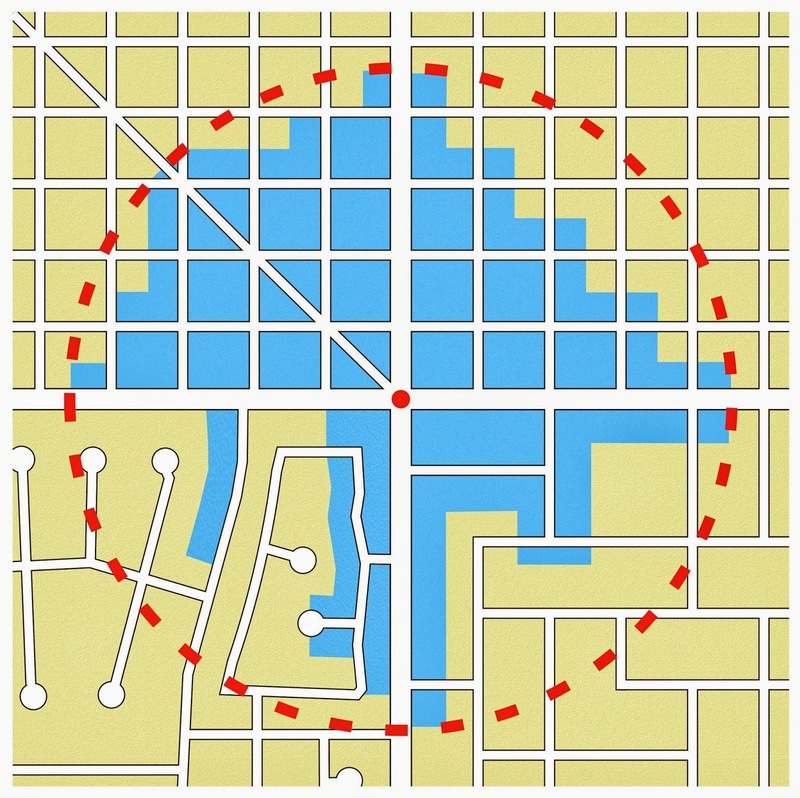 Interconnected street networks offer many ways in and out, meaning there are escape routes in case of an emergency. Dead ends got their name for a reason. No Eyes on the Street. Lack of connectivity means longer walking routes. Longer walking routes means fewer people will walk. Fewer walkers means fewer witnesses (or, "eyes on the street" in the words of the great Jane Jacobs), which criminals love. By offering many connections, walking is more convenient, meaning safety is enhanced. Slower Emergency Response Time. In an emergency, every second counts. Fewer connections means less direct routes to some locations. It also means that some locations will only have one access point; a stalled car or fallen tree can leave these areas inaccessible in a crisis. More Traffic Fatalities. A recent study by Wesley Marshall and Norman Garrick of the University of Connecticut found that the frequent intersections of a highly connected street pattern calm traffic and increase safety. Sparse street networks with few connections facilitate higher speeds and more deadly crashes. Jammed Major Streets. While no one wants a lot of through traffic zipping through neighborhood streets, disconnected street networks push nearly every trip, no matter how small, out to the major streets. This often jams them up needlessly. My children's former in-home day care was only 0.7 miles from our house, and yet the disjointed street network of a townhouse development between our homes forced me out to a state highway (which is hopelessly congested), for this minor trip. block of one street is blocked off in a neighborhood. Let's say that it was a lightly travelled block, with only 5 cars using it per hour, over 18 hours of the day. I'll assume that each car has its trip lengthened by just 1,000 feet as they go around the new obstacle. No big deal, right? Well, with the average US car getting 24.6 miles per gallon, and with the burning of a gallon of gasoline releasing 19.6 pounds of carbon dioxide into the air, the loss of this one link in the neighborhood could result in up to 5,000 pounds of extra carbon dioxide in the atmosphere per year. Is it worth it? Less Walking. Long blocks and broken connections make walking impractical. A comfortable walk is considered by most to be about 5 minutes, or about 1/4 mile. The more links that you break in the neighborhood, the less of it is reachable within 5 minutes. The graphic below demonstrates this with a hypothetical neighborhood. 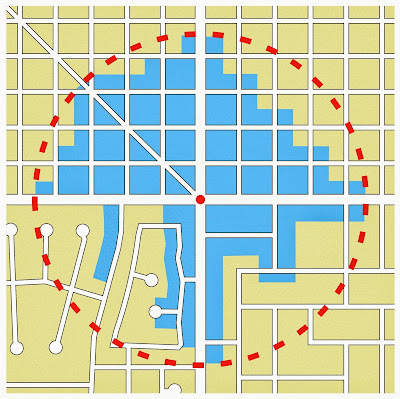 The red dashed circle represents the area within 1/4 of a mile from the red dot at the center of the neighborhood. The blue area represents the lots that can actually reach the center within 5 minutes. As you can see, the more disjointed the street network, the less walkable the neighborhood becomes. We block because we're afraid of traffic, parking jams, and crime... but blocking doesn't fix these problems and only creates additional problems. So what are we do do? Traffic: Use Traffic Calming Techniques. 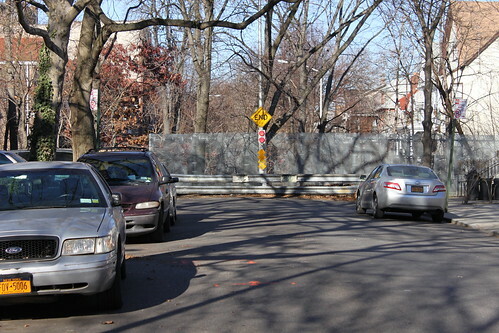 There are many proven traffic calming techniques that can slow neighborhood traffic down to safe speeds without creating a bunch of dead ends. Examples include small traffic circles squeezed into intersections which force drivers to slow down to go around the obstacles, corner bulb-outs which tighten the turning radius, chicanes which strategically narrow the road, and many others. Use designs which slow, but not those which block or divert. Parking: Park in Your Garage. 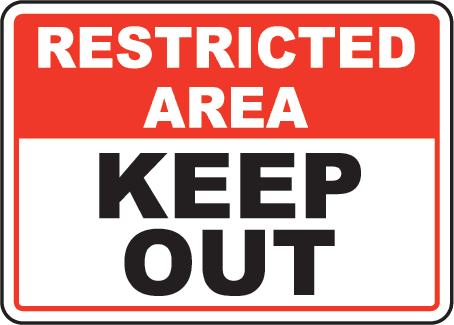 As this brilliant blog post by Alan Durning points out, many people can be quite territorial of the on-street parking spaces in front of their houses, despite the fact that this is community property than can be used by anyone. Some people just don't like the look of a bunch of parked cars (which doesn't jive with their presuppositions of country-like suburban living), but for most folks the on-street spaces are an invaluable part of their parking supply. This is because they do not use their garage for parking, but for storage or extra living space. If folks want a guaranteed private parking spot, then they need to provide it on their own property. Period. If they want to use their property for other things, then they have to deal with the inconvenience of competing for public parking on the street. 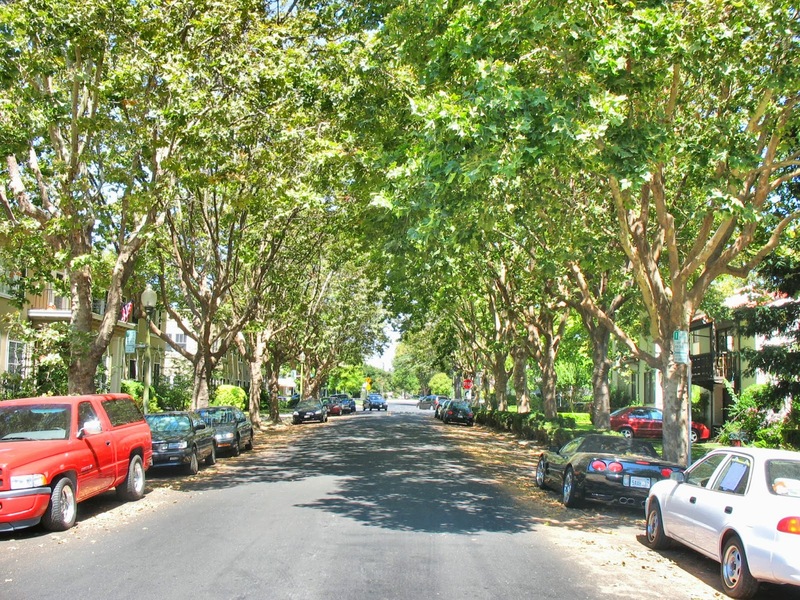 For areas with a limited off-street parking supply, and big demands on the on-street parking supply, there are ways to manage it which can improve performance which are mentioned toward the end of Mr. Durning's post. Crime: Put Eyes on the Street, and Work with the Police. Crime is terrifying, and I understand the desire to keep it at bay. But the sad reality is that creating dead ends and making walking impossible will not improve crime. Encouraging walking is helpful, and designing new buildings to have windows and doors facing the street goes a long way, too. This creates a lot of opportunities for the natural and causal surveillance of the street. One of the best resources on designing crime out of our neighborhoods is Chapter 2 of The Death and Life of Great American Cities by Jane Jacobs. Beyond that, I would suggest block parties to help neighbors get to know one another, Neighborhood Watch programs to report suspicious activity, and working with local police to improve safety in the area. To connect, or not to connect? Definitely connect. It won't affect traffic, parking, and crime as you may fear it will, and there are better solutions for these issues anyway. More importantly, you'll improve walkability and shorten driving trips, making your neighborhood more convenient and less polluting. 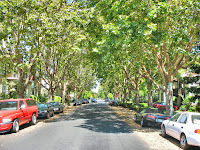 Dan, is it true that Redwood City is moving ahead with creating a BPAC/Complete Streets Commission in 2014? I am involved in area bike /ped groups and didn't hear about this. A Complete Streets Commission would enable residents who want to walk and bike to be aware and give input, so the discussion isn't dominated by the people who don't want more walking and cycling in the neighborhood.